Boaters say they have been stranded on a stretch of canal for three months after a lock was damaged. 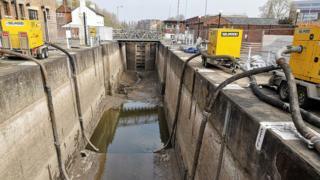 Gloucester Lock has been out of action since mid-January due to a leak under the lock gates. It is not yet known when repairs to the lock, linking the River Severn to the Gloucester and Sharpness Canal, will be completed. The Canal and River Trust said the work that had to be carried out was complicated. A temporary dam was installed to allow the lock to be drained. Now the silt needs removing so the damage can be assessed. Barry Gavin, who lives on his boat, said he was "frustrated" by the lock being broken, and he "should be near Birmingham by now". "There doesn't appear to be much work going on. There doesn't seem to be a sense of urgency," he said. He said a crane should have been brought in to "lift the boats out" of the canal to put them on the river. A Facebook group has been set up to support several traders who are currently unable to move their boats to trade at canal festivals and floating markets north of Gloucester. Mark Abraham, from the Canal and River Trust, said 22 steel planks, each 8.4m long and weighing up to 900kg, were manufactured and installed to dam the lock. He said up to 300 tonnes of silt will now have to be removed before engineers can get access to fully inspect the damage. "We don't know what we're going to find," he said. "It could be the timber sleepers are completely rotten." It had originally been hoped the lock would be repaired in time for Easter, but Mr Abraham said he could not say when work would now be finished.